Chelsea Rochman, is one of our very own Surfrider members and a third year PhD student in a Joint Doctoral Program with University of California, Davis and San Diego State University in the fields of Marine Ecology and Environmental Toxicology. Her dissertation work is focused on the trophic effects of adsorption of persistent organic contaminants (PAHs, PCBs, OCs, and PBDEs) to plastic debris in the marine environment as well as desorption of contaminants from plastic debris (BPA and phthalates) into the marine environment and its inhabitants. She has been to the North Pacific Subtropical Gyre as part of the SEAPLEX science crew with Scripps Institution of Oceanography and will very soon journey to the South Atlantic Gyre to explore toxicological questions regarding plastic marine debris with the 5 Gyres non-profit. NOAA, or the National Oceanic and Atmospheric Administration has funded researchers, like Chelsea, from UCSD from Scripps Institution of Oceanography in La Jolla to study plastic particles. These plastic samples were collected from an October voyage in the Pacific, by scientists studying the impact of debris on marine creatures and humans. The secondary cruise which will travel from Rio de Janeiro to Cape Town, South Africa to collect data from the Southern Pacific Gyre, is being hosted by the 5- Gyres Institute. By traveling in a different part of the ocean, and with confident predictions of their projected findings, they plan to expose the reality that you can no longer cross an ocean without finding plastic pollution in it. What they are looking for besides the amount of plastic that is actually in the water are toxins such as BPA and DDT, commonly found chemicals pertaining to plastic and pesticides respectively. Why would a scientist looking for plastic be concerned about a chemical pesticide all the way out in the Pacific Ocean? Plastics act as magnets for highly persistent toxic chemicals, such as DDT, in the ocean. As the volume of plastic increases, so does the adsorption of these organic compounds. If you now are wondering why this would matter to us?Why should we care about the increase in the amount of plastic in our oceans and the chemicals that become concentrated in them? 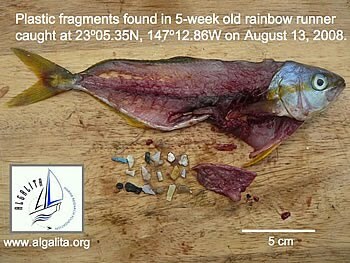 Well, these plastics become highly concentrated particles floating around the water in small sizes ready to be eaten by fish- thus entering the food chain at a level that may immediately effect our food supply. Ultimately, the aim of this research is to show a relationship of cause and effects on how toxic plastic when ingested or come into contact with will effect marine organisms and humans alike.